Persons partied well into the wee hours of this morning. Hundreds of Barbadians opted to ring in the New Year lavishly. One of the more popular party spots last night was the BTI high-rise car park, where partygoers flocked to the event Lavish: Citta Rossa. Just one of the several food stations at which patrons could delight their taste buds. as numerous bars serving premium drinks all night long. Clad in some of their best linen, patrons danced the night away as some of the island’s top deejays, including Bubbles and Stan and Scott & Mali Fresh, played some of the year’s most popular songs throughout the night. The venue also provided a perfect vantage point from which to view fireworks, which lit up the sky at exactly 12 a.m., to signal the start of the New Year. 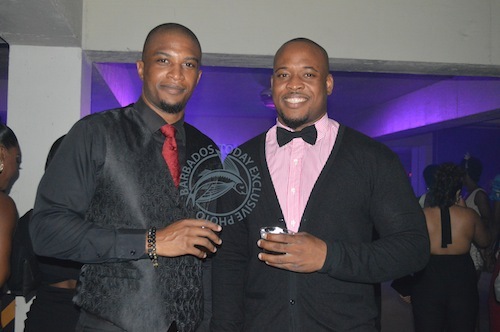 Michael Jordan (left) and Jamar Crichlow opted for ties to add a classy look.